Just recently, camera traps captured the first golden Jackal in France. The cameras photographed the animal two times in the south-eastern region, close to Switzerland. With the latest footage from local camera traps, hunters were able to identify a golden jackal on two more pictures in the Haute-Savoie. To ensure protection of the animal, the authorities did not reveal the exact location. 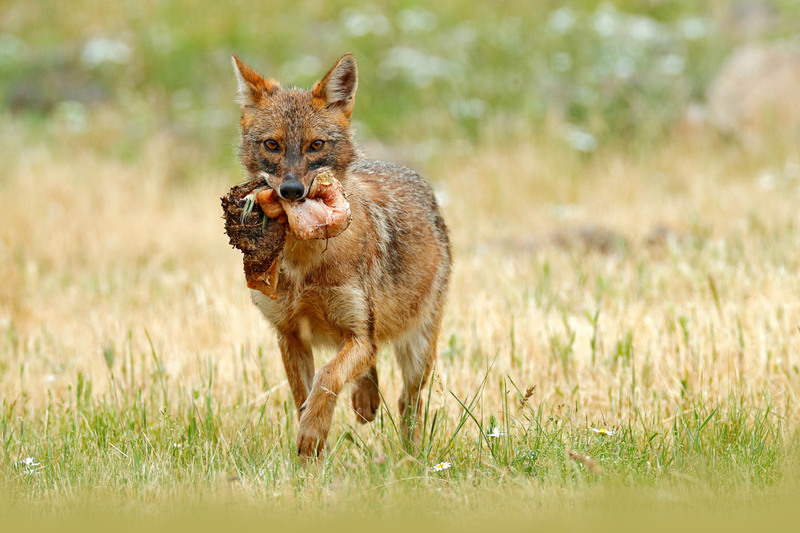 The golden jackal is a fairly new visitor to this part of Europe, but continues to expand. Over the last decade, the jackals traveled from south-east Europe towards the north and western regions. It’s presence has been confirmed in many countries, including Austria, Denmark and the Netherlands. Since jackals prefer warmer climates, the jackal can benefit from rising temperatures due to climate overheating. Just like its bigger relative (the wolf), the golden jackal is an effective and flexible coloniser. As an opportunistic feeder, the jackal finds its food by hunting and scavenging. In southern countries like Greece, many jackals live in close proximity of human settlement where they find a lot of food in the garbage. However, humans should not be afraid of golden jackals. Also farmers and livestock owners should not worry, as long as they properly protect their own animals. Some countries like France, did not list the golden jackal a protected species yet. However, we do not immediately have to fear brutal killings. France also did not list the jackal as a hunting game. This means that the law does not allow hunters to shoot it. In other countries there is a controverse whether the jackal is an invasive species, and humans should therefore control it. Invasive species are, perhaps accidentally, released into nature with human efforts. There is a rule of thumb that one in every ten exotic species makes it into nature. One in ten that make it out there, is actually able to survive. And one in ten species that survives, is able to adapt efficiently to its new location. This species may replace other (native) species, and at this point we speak of an ‘invasive species’. The golden jackal has not been released by humans into new areas. The species is making a comeback on its own power. Classifying the golden jackal as invasive, allowing controlled killings, would therefore be incorrect. Should we worry about Chernobyl wolves?